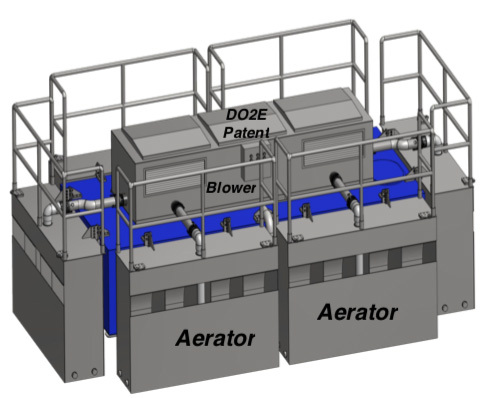 This new “Green” Aeration Technology by DO2E was specifically design for environmental remediation of large bodies of polluted water. The OTTER is scalable in size from 40 Ft. to over 400 Ft. and is capable of moving up to 750 million gallons per day, and over 60,000 pounds of Oxygen per day with NO MOVING PARTS to endanger fish or any other wildlife. It was designed for large lakes, rivers, bays, wastewater lagoons over 100 acres, and open ocean water applications as well. It can be self propelled, unmanned, and guide via GPS from virtually any location in the world. 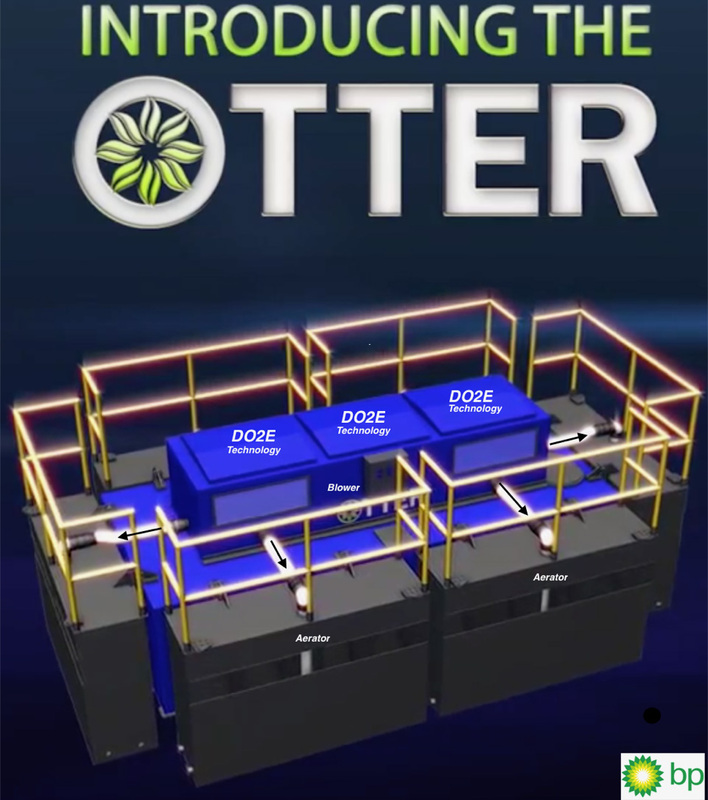 The OTTER is essentially a series of DO2E aerators aligned on a floating barge so that they are in a position to either draw from a shallow draft opening at a the surface, a specified depth (46”) or from a deeper draw via dedicated input that is piped directly into the aeration chamber. However one decides to operate the OTTER, in all other respects it is a dedicated high velocity aerator that can be designed to deliver a potent “punch” of aeration and agitation. The aeration manifold mechanism ALWAYS is located at a depth of 46” from the surface of the water source furnishing the aeration despite the depth of draw of the water. Ideally, these aerator banks will be lined up on the periphery of a barge in such a configuration that there will be 36” of freeboard between the water’s surface and the deck of the barge where the blowers and power generators are positioned. At the water’s surface level, 36” down, are placed the tops of the aerators. The bottoms of the aerators are 48” below the water’s level and communicating with the water to be remediated at that level, though the aeration manifolds WILL ALWAYS BE at the 46” level from the water’s surface. 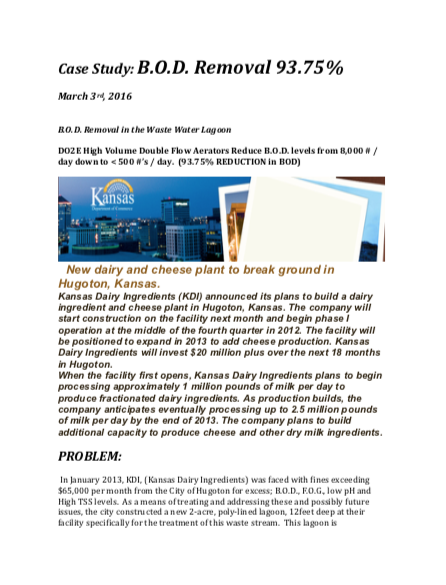 All draws of the water to be remediated will either be drawn by outside through the side openings on the barge or by a direct draw into the aerator by means of dedicated fittings into the aeration chamber. This can entail modifications of thebarge allowing pipes or corrugated flexible hoses to access the!aerator’s chambers via dedicated fittings. Below the level of the aerator’s intakes will be an additional spacing of some 36” to the bottom of the barge. This will result in the depth of the barge being 10’ from top deck to bottom. The actual length and width of the barge will be indeterminate as whatever the number of aerators required, the depth of the water to be remediated, and the mounting of the various generators and blowers will be the determining factors for any particular placement in this regard. All of the aerators will discharge into the environment from parallel ports oriented at the same depth. By means of this outflow the barge can be maneuvered by various modifications such as rudders, fins, thrusters, etc., using the directed force from the water current engendered to effect any particular direction or orientation. All principles of the aeration device are operant as they are in all of our current DO2E Aerators. That is, the utilization of coarse and fine bubbles to effect an efficient aeration process without the necessity of moving parts and to use resonance principles of the outflowing stream to create a more thorough mixing environment. The use of LNG as a fuel for current generation is intended as is the use of regenerative blowers to power the aerator array. Again, the absence of moving parts and the ”arm’s length” approach to electrical sources were considered in the design criteria of the OTTER. One of the primary uses of the OTTER is to remediate large oxygen deprived, and environmentally challenged bodies of water containing toxic algae without creating any negative impact to aquatic life or the environment, regardless of size and depth of the contaminated site. The goals of the OTTER are to improve the aquatic environment for all aquatic life forms regardless of species and size, without the use of chemicals. A further addendum may be added in the form of an AIR SLED whose purpose is to “stir-up” a bottom to be remediated. Details on this structure will follow including how it is visualized to be employed from the OTTER.